I’m the spender in our family. 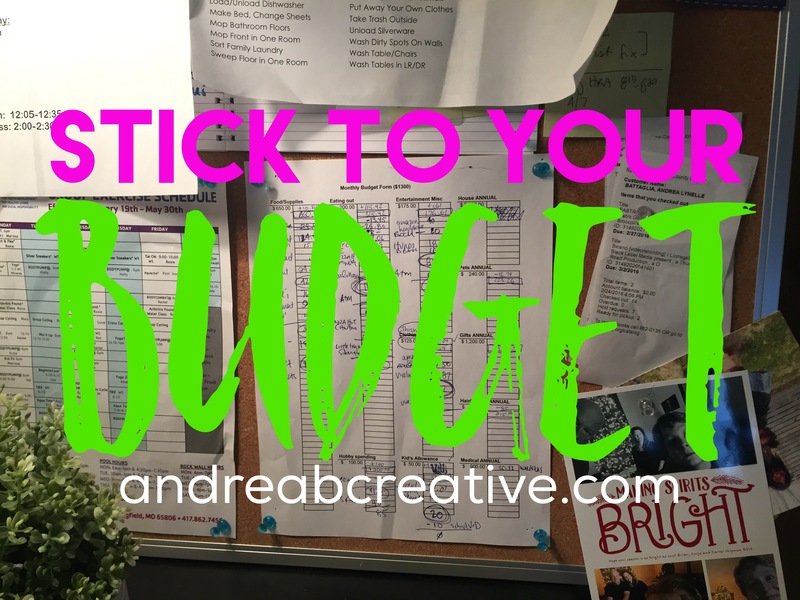 And recently, I was reminded in full force how easily your well-planned budget can slip right through your fingers. I had that option many times and I resisted every single time. Yes, I love to spend money! But, I realize that spending money now means that we’ll have less later and I refuse to dip into next month’s budget for what I want right now. So I decided to take the more prudent road and realized that each day I didn’t mindlessly spend on things I didn’t need, it strengthened my resolve to practice financial stewardship again and again. I know it isn’t easy and, honestly, I’m glad it’s a new month and our budget has started over. I was reminded of some pretty important lessons that I’m ready to share with you. The lesson here isn’t even what you’re saying “No” to, it’s the fact that you’re saying “No.” Because the more you say it to things you don’t really need, the more comfortable and confident you become in saying it. And that is a life-skill that needs to be mastered. There will be things that will demand your time, your energy and your budget – many of them aren’t worth your time, your energy or your budget. And when you learn to say “No” because you have to, you become more aware of saying “No” when you need to. Sticking to your budget means you practice more thoughtful spending. Do you know what I wanted to buy this month? Everything! New clothes, fancy socks, running shoes – you name it and I considered it this month. But, we’d already spent most of our budget this month because of a few necessary purchases. So we had to be very considerate with what we purchased during the last week. I even thought of this with groceries – a necessity – but instead of loading up, I only purchased what we needed for a few days. I remember seeing this strategy from a co-worker in retail a few years ago. She waited until she needed an item and only purchased that item – in a world of excess, hers was a simple solution that I think about even today. Sticking to your budget makes you evaluate your priorities. My husband and I made goals together this year and one of our goals includes more trips and fun family activities. We budgeted for this and it meant lessening our spending in other categories to make this goal a reality. No matter what your budget looks like, you’ll have to decide what you value and make room in your budget to make that happen. It could be going back to school, it could be a fancy purchase, it could be a relaxing vacation – if it’s a priority for you, it’s worth it. Realizing what you can live without helps you to realize what you really want to live with. Your budget – no matter the size – will help you stay on track financially. It’s easy to get caught up in the moment of what you want, but realize that something better is waiting for you. It could be your confidence, your resolve, your financial freedom – it’s worth it to set your eyes to the goal and push on until you reach your destination. And yes, I purchased quite a few things today – but it is a new month, my budget has started over and I kept it within my spending limits! I don’t have it all figured out, but as the spender in my family, I certainly heed the sage advice of my saver and I appreciate how our budget is SIMPLE – because that is what keeps me, the spender, on track each and every month.